Twice a year I go through our seed stash. I should probably try to keep them a bit more organized through the year but that just doesn’t fit with my personality. If you have a large garden then growing plants from seed is the least expensive route to go. 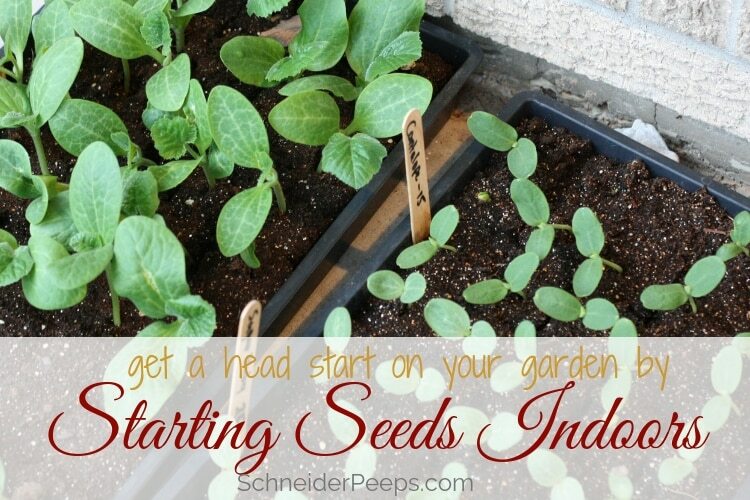 And starting seeds indoors will give you the benefits of planting transplants. While all seeds can be started in the ground (that’s called direct seeding or direct sowing) that’s how they survive “in the wild” after all, some seeds will do better if you start them inside. The smaller the seed the harder it will be to get it to grow when direct seeded. Now, that doesn’t mean it’s impossible, just harder. A bean seed will germinate just fine in the garden but a lettuce seed may or may not germinate in the garden (this is why I just sprinkle lots of lettuce seeds in the general area I want to grow lettuce). All of these plants have pretty small seeds and do well when started inside, spinach, lettuce, chard, cabbage, cauliflower, broccoli, and tomatoes. A short growing season means that some plants must be started inside. If you only have a 90 day growing season, you can’t grow watermelons….unless you start them at least 4 weeks before your average last frost date. They need at least 120 days to mature and 90 days just won’t cut it. BUT when I say growing season, I don’t mean just from last frost to first frost, I mean when the climate is such that you can actually grow that particular vegetable. In zone 9 (where I am) we have 9 months between last frost in February and first frost in November. But we can’t really grow anything but okra, basil, moringa and peppers from mid July until mid September. So our spring/summer growing season is really only about 5 months. This means that if I want to get a good harvest of tomatoes, melons, beans or squash I need to go ahead and start those early or buy transplants. Succession planting can be done by starting seeds indoors. When I plant transplants (either the ones I’ve started from seed or ones I’ve purchased) I also direct sow some seeds. That way I can, hopefully, have a full season harvest. Or if something attacks my transplants I have backup. This happened one year when we had serious issues with vine borers. We were able to get rid of the borers but they destroyed our first planting of squash and zucchini. Since we sowed some seeds with the transplants, those seeds had already germinated and we were able to still have a harvest before it got too hot. If you’ve had a problem with seeds germinating or pests destroying your seedlings, starting seeds indoors is a good idea. Sometimes plants just need protection when they’re little. This is my main motivation for starting seeds this year. Last year I decided to direct sow most of our seeds. We had a lot going on and I just couldn’t get it together to start seeds when I needed to. Then we had this crazy pill bug invasion, and I know pill bugs aren’t supposed to eat green stuff, only brown stuff, I’m here to tell you they do. I’d go out in the morning and my bean seedlings would be eaten through the stems (not cut from cutworms) and the pill bugs would be on the leaves of the other bean plants and the squash plants just munching on them. I’m hoping that if I plant transplants this year they will be tough enough that the pill bugs (or cutworms) won’t bother them. Starting seeds is cheaper and the variety is greater than buying transplants. Let’s face it, when we buy transplants we’re paying someone else to start our seeds for us. And that is totally fine. But they don’t always want to start the seeds that I want and so I give up a level of control over my garden when I chose to not start my own seeds. 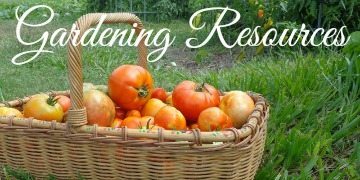 While I save seeds from my garden, I also purchase seeds from MiGardener. They sell heirloom seeds and most of them are just 99 cents a packet. If you use this link, you’ll also get a 10% discount on your order. When I say “starting seeds indoors” I don’t necessarily mean inside your house. You can use a garage, greenhouse, shed, or even a covered patio depending on your climate. Because I live in a very mild winter climate, I just use my front porch to start seeds. 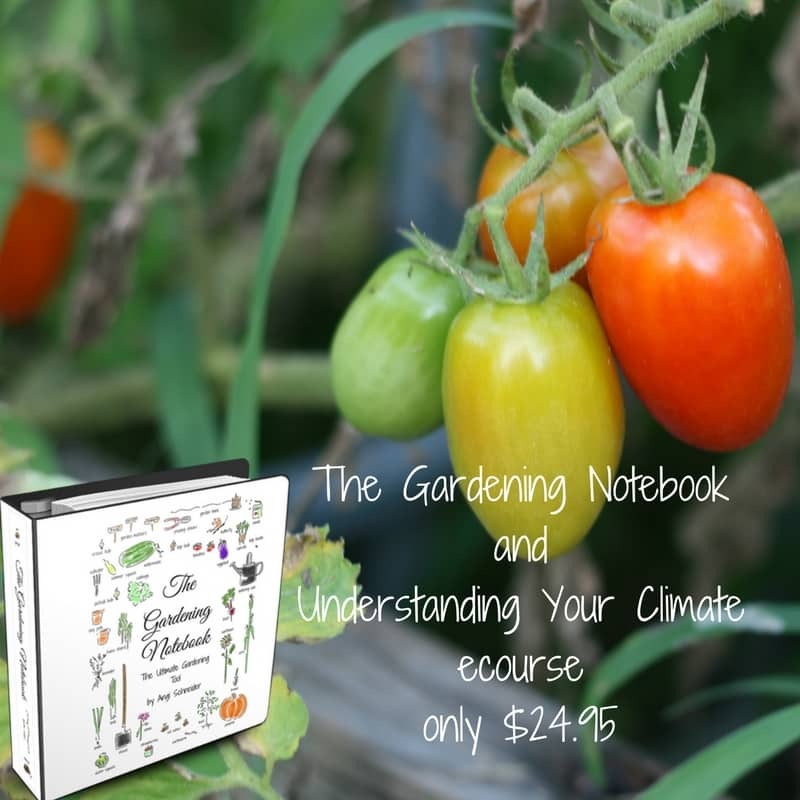 If you want to learn more about how your climate affects your garden, we have a short ecourse that will teach you about frost dates, cold hardy and heat zones, day length, chill hours, and much more. You need seeds. Determine what seeds you want to start inside. Maybe you only want to do a couple of tomato plants. That’s great. Maybe you want to do 250 – you know some of everything. That’s great, too. It doesn’t really matter, just decide. We have some great planting calculator worksheets to help you figure out how many plants you need to feed your family for a year. Just enter your email in the form below and they’ll be emailed to you. You need soil. I personally use seed starter soil mix that I buy in bags from the store. There are lots of seed starting soil mix recipes so if you’d prefer to just mix your own that’s good too. Here’s a simple recipe from Reformation Acres. If you want a couple more that are more “from scratch” here are some good ones from Better Hens and Gardens. I’ve also read of people just using garden soil – you know from their garden – to start their seeds. I really think seeds are hardier than we give them credit for. I LOVE my soil blocker. We’ve used it for year and I just really, really love it. I love that I can get 50 seeds started in one tray. I love that I don’t have to try to save or round up recyclables (although I do save any pots that transplants come in). And I love that it’s just enough soil to keep the transplants healthy until they can go in the ground and they don’t get root bound. But you don’t have to use a soil blocker to start seeds you can also use real containers, you know the kind your buy in the garden section of the store and pay a fortune for. You need light. This can be sunlight or grow lights. If you have a sunny window sill or areas, use that. If not, you might need to set up an area with a grow light and maybe a heating pad for things like tomatoes and peppers. Or you could even make a light hut – which I think is pretty cool. You need water. 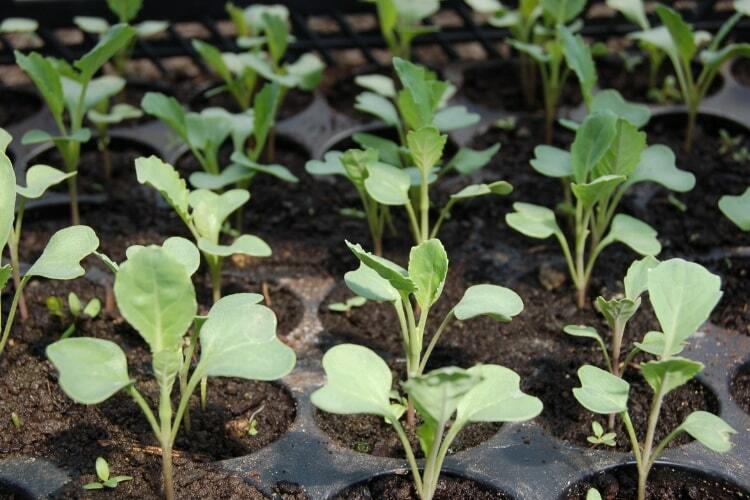 Water is a key ingredient to germination (or sprouting) success. 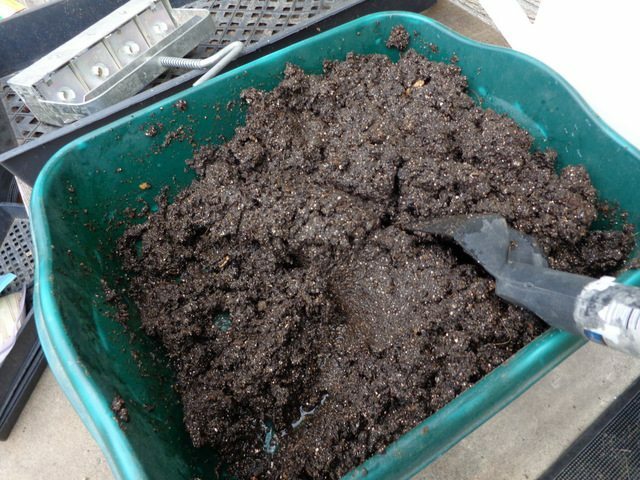 The soil should be wet when you put it in your containers or use your soil blocker. Every day or so, just take a spray bottle and spray the soil with water. As the plants grow, keep them moist but not dripping wet or the roots will rot. That’s pretty much it. Starting seeds is a simple process but there are many variables. Sometimes you’ll get amazing transplants and sometimes you won’t. If you’re just starting out, think of this first year as an experiment – whatever happens is great because you’re going to learn from it. 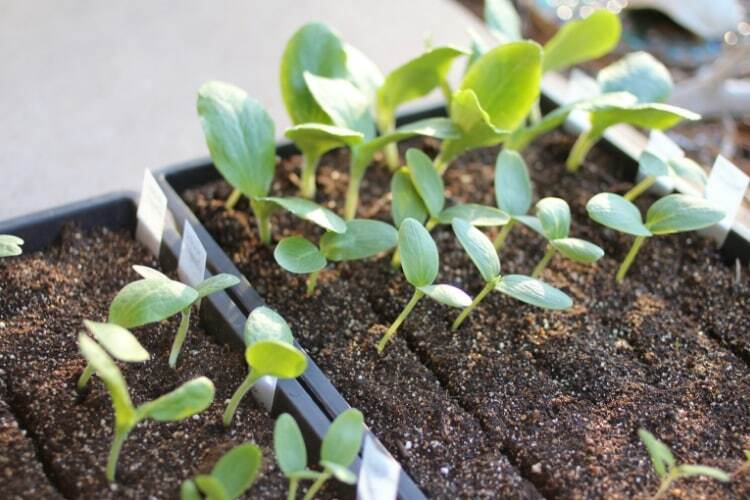 Once you’re weather starts to warm up, don’t just take your seedlings from under the grow lights and plop them in your garden. If they’ve been truly started indoors you will need to harden them off. Here’s a great hardening off guide from 104 Homestead. If you live in a mild climate and start your seeds on your porch like I do, you don’t need to worry about hardening them off. oh, And make sure you keep notes of what seeds you start and when. I promise you, you won’t remember if you don’t. If you need some garden note organization help, I suggest The Gardening Notebook. This is a 120 page printable notebook. You print the pages that you need and put them in a three ring binder. It’s truly wonderful. What are some of your seed starting tips or questions? Great post! 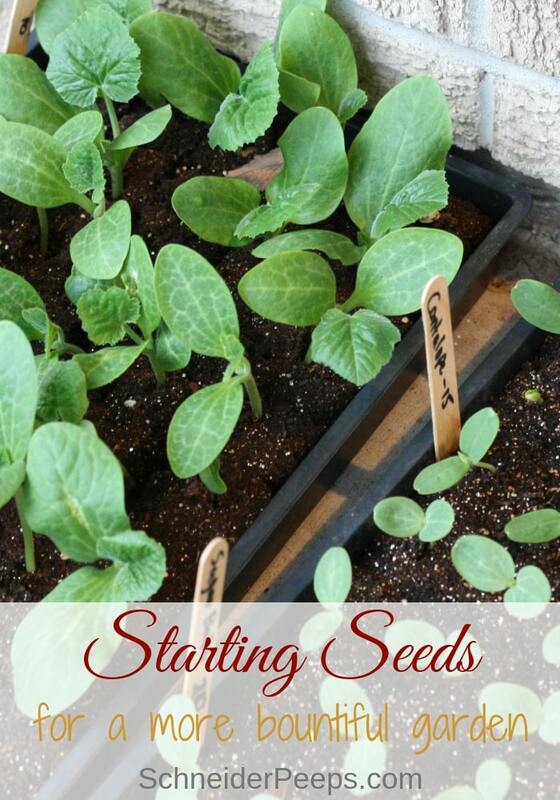 Thanks for sharing…I really need to get my seeds started soon! A super informative article, Angi! I had never heard of a soil blocker, what an excellent idea. Thank you so much for linking to my articles as well. I’m sharing this post today! Your so welcome, Kristi. I’m really digging the grow hut. I’m trying to come up with a reason as to why I “need” one. For the past 4 years I have started seeds in gallon plastic jugs. I cut the jugs in half leaving the top connected. I use seed starter soil because it works best for me. I water the soil well before planting . After I plant the seeds I tape the jug closed with duct tape-just one piece in the front. I remove the cap. With this method I get stronger stemmed seedlings and they do not dry out . That’s a great idea – you made a little mini greenhouse. Thanks for sharing! 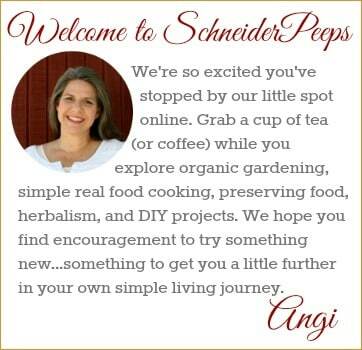 Thanks for getting us motivated Angi – there’s lots of good information here, and thanks for sharing! We tried this one year with tomatoes and peppers and they got tall and really spindly. When I replanted them outside, they didn’t do well because the stems weren’t thick like the ones from the greenhouse, even though they were the recommended “age”. Any suggestions? When you plant tomaotes it’s good to plant them all the way up to the first set of real leaves. So if your transplants are long and spindly you have 3-4″ of stem under the ground. All those little hairs on the stem will grow into roots. Also, as your transplants grow you can repot them into bigger pots until they’re ready to go outside. 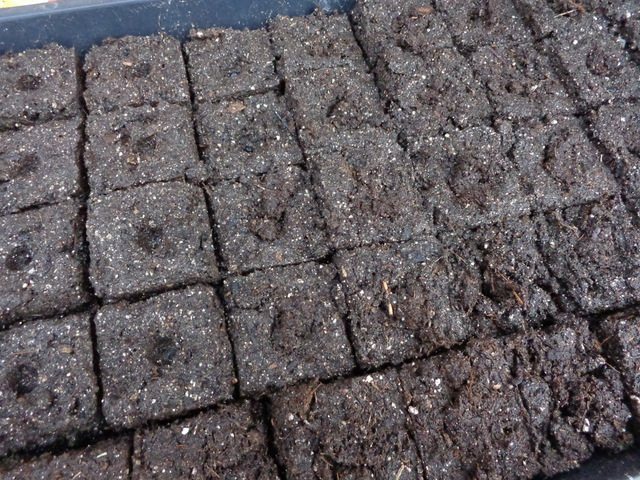 When they’re started in the soil blocks it makes it really easy to pot them if they can’t be planted whem you orignally thought they would – like if you get a late winter storm or something. Great post! I think I’m going to get one of those soil blockers. Very inspiring post! It looks like you’ve got a good start on your spring garden! I’d love for you to share this on The Maple Hill Hop! Thanks, Daisy. I put the hop on my weekly list so I don’t forget. I’ll be sharing this post next week. Thanks for sharing! We love inspiration! I couldn’t figure out what a ‘soil blocker’ was, for a while until I kept reading. I hope others could understand. A picture would help immensely! Thanks for the info! Thanks for mentioning that. There’s one in the photo with the soil, but I guess I should point it out. I appreciate the feedback. Tis the season for seed starting. I’m so excited! Great info and thanks for sharing. I think I’m starting my seeds this weekend because the temperatures are finally starting to rise, it’s been so cold here in Texas. Looks like you’re going to have a great garden! Yes, it has been cold here in Texas – but I know the extreme heat and humidity is coming so I’m trying to be thankful. We woke up to a beautiful sunny morning this morning – it was nice after not seeing the sun for a few days. You blog is beautiful, I love your paper art. Thanks so much for visiting. That’s a good idea to make watering part of your breakfast routine. Thanks for sharing!